A few days ago I shared Zachary's School's Out! Challenge, but wanted to also share what we're doing with the girls. They've been working like mad to earn some of the treats on their list and have already listened to three different audio books in the Narnia series and completed NUMEROUS other feats to earn those precious points. 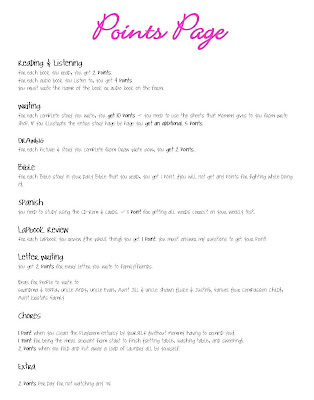 The girls earn points based on a list that I pulled together of school-type things or helping out around the house. There are different levels of points that they can cash in for a prize...or show a little restraint to save up for a big prize. Once a prize has been earned it is crossed off the list and they can start on another one. I happen to have some things that I found at yard sales for **cheap, cheap, cheap** to use as bribery bait incentive. 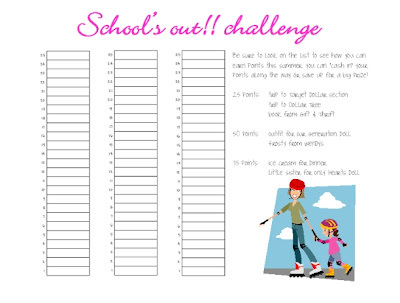 If you are interested in doing something similar with your kids, I uploaded a blank set of Summer Challenge sheets for boys and girls to Scribd. Just follow the link and you can download your own set to print off. 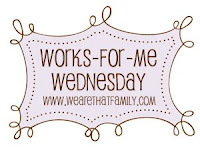 If it doesn't work for you, let me know and I can email you the pdf file. This is really cute! I saw Carissa idea last year and wanted to do something similar too! Our kiddos just signed up for Summer Reading, and they get a free pool pass once they've completed their lists......it's AMAZING how much my daughter has read in the past two days, LOL, like 10 reader books a day. I guess I've been missing something with the incentives, ha ha!